They are many types of beans available all of them having amazing health benefits. Red Kidney Beans also called Rajma are a deep red color and packed with protein soluble (and insoluble) fiber, folate (vitamin B9), vitamin B1, magnesium, potassium and a number of other strength offering nutrients. There are different names given to kidney beans in different languages like Rajma in Hindi, Frijol in Spanish, Haricot rouge in French, and Patani in Filipino. They are known for their great taste and nutritious benefits, so let’s see some of the amazing health benefits of Kidney Beans. Pregnant women’s need extra attention to their health during pregnancy and focus on consuming healthy food items that are rich in proteins, vitamins, iron and calcium. Kidney Beans are rich in antioxidants, iron, protein and a very good source of cholesterol-lowering fibre that would certainly help your baby to grow well, both mentally and physically. 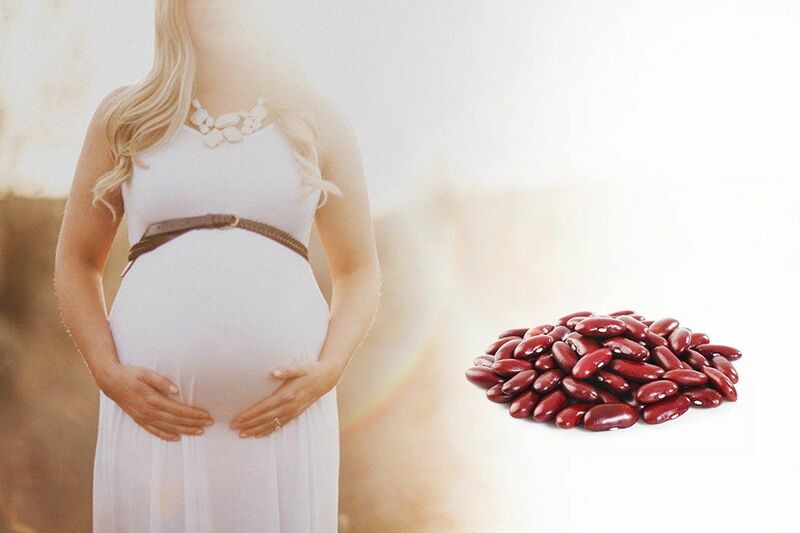 Let’s see why kidney beans are super-food for women’s during pregnancy. During pregnancy, your blood volume expands. Therefore you need more iron to make more haemoglobin. Kidney beans eliminate iron deficiency by increasing the iron level while promoting the cognitive development of your baby. It also aids in overall fetal development and even promotes the placenta to grow. These beans are also natural antioxidants that are useful for the skin of both you and the growing baby. These beans can also reduce your risk of developing gestational diabetes. Kidney beans contain dietary fibre that helps to maintain your blood cholesterol levels during pregnancy. Kidney beans contain about 8 essential amino acids that can prepare protein in your body. These amino acids are highly helpful for fighting many infections and diseases as it helps in developing a strong immune system. The presence of dietary fiber in kidney beans enables to maintain your cholesterol levels while you are pregnant. Generally, it is recommended you should consume about 70 grams of protein, which can be obtained by eating one and a half cup of kidney beans. 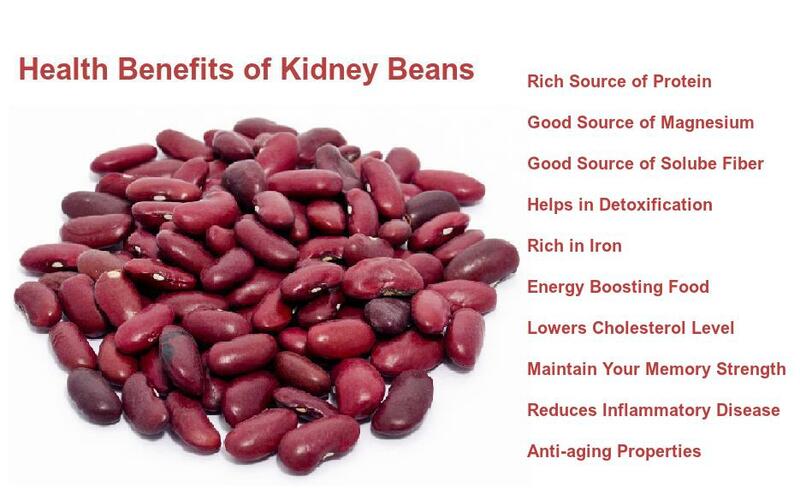 Kidney beans are a rich source of proteins, making them eligible for fulfilling the major daily protein requirements. With eight essential amino acids present in them, it helps in fighting against several diseases and boosting the immunity system. Kidney beans contain magnesium which helps in relieving fatigue by relaxing the muscles, nerves, and blood vessels. Due to magnesium, they are beneficial in cardiovascular effects, asthma, muscle soreness, and migraine headaches. When there is proper magnesium around, veins and arteries breathe a sigh of relief and relax, which lessens resistance and improves the flow of blood, oxygen, and nutrients throughout the body. They are a good source of soluble fibre content which regulates the blood glucose absorption from the body. It acts as a very good food with insulin resistance, hypoglycemia or diabetes. Being high in certain nutrients which involve in the process of detoxification, it lowers the risk of a number of inflammatory diseases and cardiovascular diseases and promotes and maintains optimal health. Kidney beans are an excellent source of the trace mineral, molybdenum, an integral component of the enzyme sulphite oxidase, which is responsible for detoxifying sulphites. They can increase your energy by helping to replenish your iron stores. They are rich in iron and their regular consumption helps in the process of respiration at the cellular level. The iron content of the beans helps in synthesizing haemoglobin to aid in the carriage of oxygen to the cells. Red Kidney Beans are also supercharged with antioxidants which are believed to have strong anti-aging properties and to promote longevity by limiting the damage caused by free radicals. They are a good source of the trace mineral manganese which is an essential cofactor in a number of enzymes important in energy production and antioxidant defences. They are again rich in dietary fibre which helps to lower blood cholesterol level in the body and further reduces the risk heart diseases, like strokes and high blood pressure. Being rich in Vitamin B, it contains thiamin which participates in enzymatic reactions central to energy production and is also critical for brain cell and cognitive functions. It synthesizes acetylcholine, the important neurotransmitter essential for memory and whose lack causes age-related memory issues.